"Your Place for Boarding and Grooming"
Bathing, nail trimming, shave-downs, and/or hair styling are available by appointment...and what better time for this grooming than when your pet is already boarding! The "Boarder Bath and Nail trim" is always offered for any of our visiting guests -- but call the groomer to add in any shaving, trimming, or styling extras for a "Pro Groom". your next appointment at 810-984-2330. Boarder Bath and Nails -- available for all our boarding guests (at a discount). Non-Boarder Bath and Nails -- available by appointment for our non-boarding clients or between boarding visits. Professional Groom (Pro-Groom) -- bath & nail trim with shaving or trimming of the hair coat to a certain style by our Certified Groomer; by appointment only and after consulting with the groomer. This option is for boarding guests as well as non-boarding clients. Nail Trim only -- for our boarding guests and non-boarding clients. 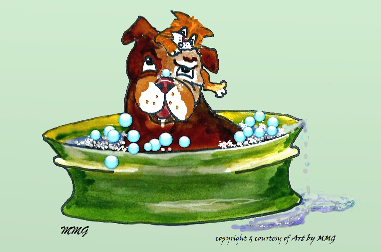 Flea Bath -- may be added as needed for any bathing option. All bathing options include: shampoo, conditioner, blow-drying, cleaning ears (the outside area only), hair brushing (additional charge for thick coats or matted hair), and nail trim (if the pet allows). Grooming price varies by size of the pet, length or condition of haircoat, ease or difficulty in handling, and time involved. Please note that these conditions can vary from appointment to appointment. Pets must be seen for a more accurate price estimate. Call 810-984-2330 for an appointment and/or an initial estimate. Go back to: "About Services"